Asbestos is a risk to health only when it is inhaled (breathed in) as fine dust. The risk to health increases with the number of fibres inhaled and with frequency of exposure. When asbestos dust is inhaled, larger fibres tend to be cleared by protective mechanisms in the lungs and upper respiratory tract. The finer fibres are more difficult to remove, and may become deposited in the lungs, or penetrate further into the body. 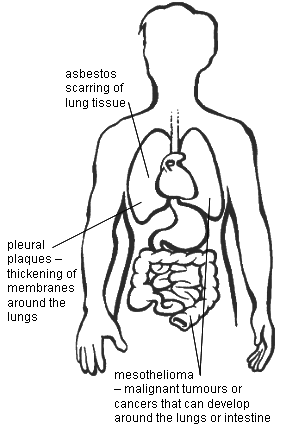 Smoking can increase the risk of developing lung cancer following exposure to asbestos. Symptoms of asbestos-related diseases include breathing difficulties and ‘scarring’ of the lung that can be detected by X-ray. The harmful effects following ingestion of asbestos have not been clearly documented. However, there is some evidence that acute oral exposure may induce precursor lesions of colon cancer, and that chronic oral exposure may lead to an increased risk of gastrointestinal tumours. Based on the HealthEd resource All About Asbestos, which can be downloaded and ordered from the HealthEd website.